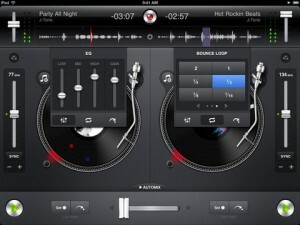 Beautifully and carefully reconstructing the look of traditional 2 deck mixing, and having won numerous awards – the DJay app from Algoriddim is one of the best of the bunch. It lets you mix, scratch, and cross-fade, and control EQ and pitch to your heart’s content. The iPad version may be a little pricey, but they have redesigned the graphics for the retina display, and a iPhone version is available for just £0.69/$0.99.